Wood River Fire & Rescue firefighter Kerri Herlinger turns the hose on a hotspot near Star Bridge on Broadford Road on Monday. Fire officials say the fire was started by a campfire that spread out of control. The first local wildfire of the season was sparked in a forested area south of Hailey on Sunday night, also igniting what could be a difficult fire season. Wood River Fire & Rescue Chief Bart Lassman said the 2.5-acre fire was sparked at about 8:30 p.m. Sunday just south of the Star Bridge, two and a half miles south of Hailey on Broadford Road. Lassman said the fire was started by a man who had a camp set up near the bridge. "He lit a campfire, and a spark from the campfire ignited the cotton," he said. "There was probably 6 to 8 inches of cotton seed on the ground and it just took off." Wood River Fire & Rescue was the first agency to respond, but was joined by the Hailey Fire Department, Bellevue Fire Department and the Ketchum Rural Fire Department that night for a total of 30 firefighters battling the blaze. Lassman said the fire destroyed the man's camp and many of his belongings and threatened a nearby home. Though the home was unoccupied and no lives were threatened, Lassman said the crews used a bulldozer provided by a private contractor to keep the fire from spreading closer to the structure. Blaine County Sheriff Gene Ramsey said his agency responded to the fire as well. He said the agency provided traffic control but also investigated the cause of the fire. "We talked to the person who was camped out there," Ramsey said. He said the fire was deemed accidental, mostly due to the blustery winds Sunday night that helped drag a spark to the cotton seed. "He just started a fire and the wind came up," he said. "It's just kind of like gasoline out there right now." Ramsey said the man stated that he had been living in the woods near Star Bridge for a couple of months. Though Ramsey said he isn't sure if the area is public land, he said there would not be an investigation for trespassing. Crews from the Sun Valley Fire Department and Wood River Fire & Rescue mopped up the area Monday, keeping the fire contained but allowing it to burn in some areas. Lassman said the area was too dangerous for firefighters to completely control the fire Sunday night. "We had to pull people out of there," he said. "We had a lot of snags and widow-makers—trees that are leaning—and the potential for these trees to fall is pretty great. Working at night is pretty dangerous under those conditions." Lassman said that though this was the first wildfire of the season, it wasn't the first of the year—there was a wildfire associated with burning slash in irrigation canals in January or February. But, he said, with the forecast set to be windy and no rain expected until the weekend, open burning is prohibited in the county. "Fire conditions are high," he said. "We are under a cold front moving through [on Monday], so we're really working hard to get this fire extinguished. We just don't want it to spread." Lassman said the fire was fully extinguished by 7 p.m. Monday night. 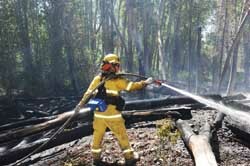 A 25-acre wildfire flared up six miles northwest of Stanley on Sunday in the Elk Creek drainage along state Highway 21. Traffic was stopped for about an hour and a half while the blaze was fought by the U.S. Forest Service, the BLM and the Sawtooth Valley Fire Department. Officials say the fire was likely human-caused, and was contained as expected by 2 p.m. Monday.